Tiger Woods, (even before he obliterated the Masters’ 1997 field by 12 shots) was once thought by none other than Jack Nicklaus and Arnold Palmer that he’d win more Masters than the duo’s combined 10(!) Green Jackets. However, Woods has inexplicably not won at Augusta National since 2005. That’s a pile of TW lovers’ wagering loot lost over a decade and a half. So, what gives? Is there a main reason or several? GolfWorld’s Joel Beall believes there are four areas on what’s holding back El Tigre. Little did he know, Jack finished with the most accurate harbinger of them all. Injuries, swing changes, bad luck, a private life gone public. Take your pick for the “something” that, disappointingly for many, has made the final part of Jack’s prophecy come true. What matters is Woods has not won the tournament that made him famous in 14 years. Power is one of the Four Horsemen. Early on, Tiger dominated Augusta with brute force. At his 1997 triumph, Tiger’s 323.1-yard driving mark didn’t just pace the field. It was 46 yards longer than the tournament average, and 25 yards past anyone else. “The second hole was frightening. I had the honor and I hit my drive to the brow of the hill on the second, just about reaching with my 4-wood,” Colin Montgomerie said. “And he was down—he must have been 150 yards ahead of me and hit a 9-iron to the back. 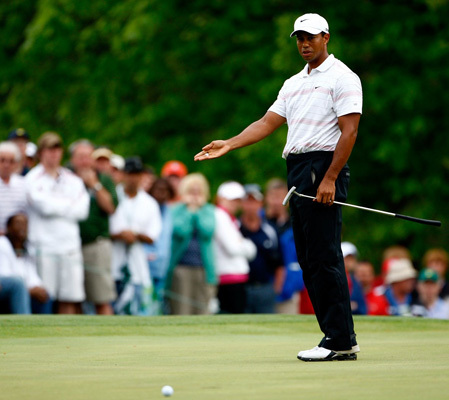 You are here: The Blog / Why Is Tiger Woods Winless At Augusta National Since 2005?